One of the great part of food blogging is that you can discover new and interesting recipes almost every time you open your browser; you can see what bloggers cook and enjoy in different parts of the world, and of course try to prepare those amazing international recipes at home. 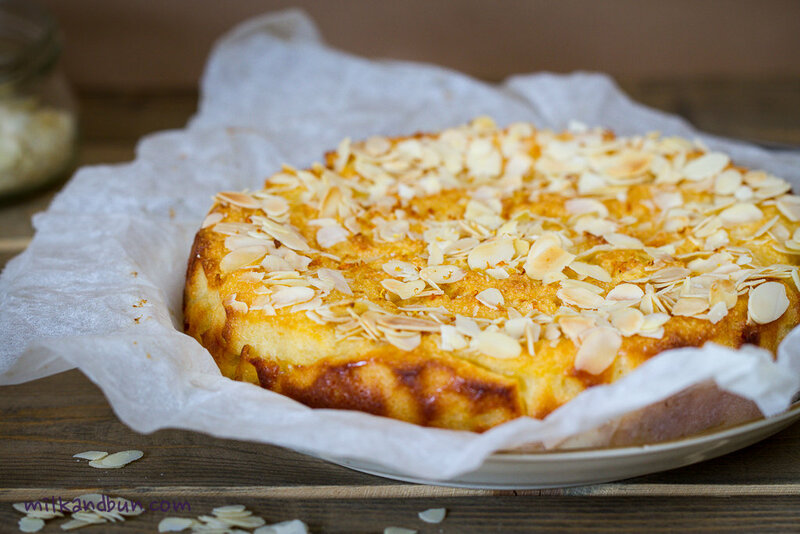 So, when I saw the ricotta-almond cake that Margherita shared at her blog, I immediately saved it and decided to make it the other day. The cake turned out really moist and very nutty. I even could say that you can feel more nuts than ricotta, but it’s not bad at all (especially if you love lots of nuts in baking). Moreover, orange zest gave a fantastic aroma to the cake. The only thing – it was a bit too sweet to my taste, so I will reduce the quantity of sugar next time. In a bowl, stir ricotta with ground almonds. Set aside. Beat egg whites with lemon juice and salt until steady peaks. Set aside. In a large bowl, blend butter with sugar and orange zest until creamy. Mix in egg yolks, one at a time. Carefully fold beaten egg whites into ricotta mixture. Line the baking tin with greased parchment. Pour in batter. 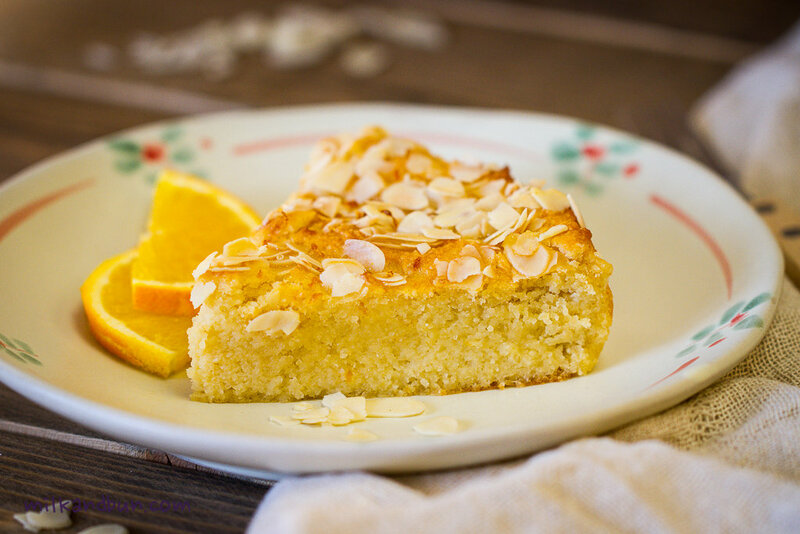 Sprinkle with almond flakes and orange zest. Bake in preheated 170C oven for 50 minutes or until golden. Let it cool in the tin for 20-30 minutes and then carefully transfer to a serving plate. Feb24February 24, 2016 • By milkandbun • This entry was posted in Baking, Cakes, Desserts and tagged almond ricotta cake, baking, Blogging, cake, food blogger, food photo, food photography, photo, ricotta cake, sweet. Bookmark the permalink. why hello there – I was scrolling through my favourite posts, which I haven’t done in a sinfully long time, and I happen upon this recipe. Which reminded me that I have a 250 g pack of ricotta siting in the fridge (1 month past its sell by date – but as it’s pasteurised and I trust my senses rather than a computer generated number, I hurrried to the kitchen, realised the ricotta was still good and in the space of 15 minutes while on the phone with my mum, whipped up this cake. It is now in the oven, ready to surprise Mr Polianthus when he gets home! Thanks (I reduced sugar to 100 g, not much, but a bit) – looks like you used ground almonds without skins, I only had half a packet of those left so had to use almonds with skins for the rest – am looking forward to seeing how it will turn out. Have you ever made a Pashka by the way? I used a special mold for that, but you can sub it for any bowl. 😀 Thanks for stopped by! Thank you so much for your nice words, dear Freda! I love this! So light but still with a decadent richness to it. I’ve always been a huge fan of desserts with almond on top too, love the texture. Agree with your intro around learning from other bloggers – and I’ve just earmarked this recipe to make for my weekend dessert tomorrow! When is tea at your house again?????? Well it’s not sweet to invite your self to someones house for food! But I’ll TAKE IT!!! This looks divine! All your pictures on your blogs are such a food inspiration. Have a nice day week ahead!